Researchers in the UK, France and US have moved beyond metal–organic framework (MOF) chemists’ focus on crystalline solids with evidence they’ve made the first liquid MOF.1 Findings from Thomas Bennett at the University of Cambridge, UK, and colleagues suggest it may be possible to cast soft, fragile MOFs into desirable shapes and retain their properties. ‘Thousands of new composite materials’ may now be possible, Bennett tells Chemistry World, from mixing liquid MOFs with other substances. ‘MOFs are more dynamic and flexible than otherwise thought, so they might actually be useful for a whole range of new applications,’ he adds. Solid MOFs form extremely porous crystalline 3D structures useful for storing or capturing gases, with organic linkers holding together metal ions or clusters. However, Bennett has been trying to explore different MOF states to discover new structural properties. In 2015, his team reported that a zeolitic imidazolate framework (ZIF), a type of MOF, made from a combination of zinc and imidazolate ions formed a ‘melt-quenched glass’ on heating to almost 600˚C.2 Because forming such glasses requires a substance to melt in the first place, his team inferred it had been liquid, but their analysis was limited. 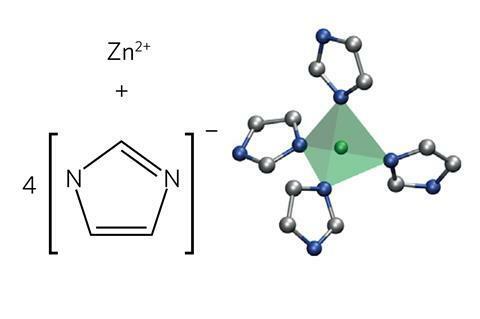 Bennett therefore returned to fully characterise the ZIF’s liquid structure with the expertise of François-Xavier Coudert’s team at Chimie ParisTech in France. The team melted the ZIF at high temperature again, finding it has ‘viscosity much like that of silica’, according to Bennett. They then collected neutron and x-ray diffraction data from it at the UK’s ISIS Neutron and Muon Source and the Diamond synchrotron facilities, respectively. Coudert’s computational skills enabled the chemists to compare the diffraction data to that predicted from computational studies. First principles molecular dynamics simulations also provided them with information about the liquid’s thermodynamic properties. 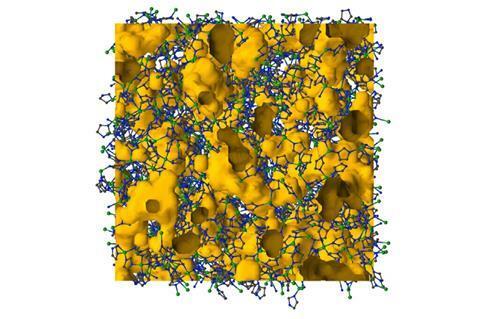 The framework and porosity survive the transition to liquid form, the modelling showed. Additionally, above the ZIF’s melting temperature there’s a jump in its heat capacity ‘that’s really indicative of forming a liquid phase from a solid’, Bennett explains.